Do you leak when you cough, sneeze or exercise? Tired of bulky pads and uncomfortable inserts? There’s a better way. 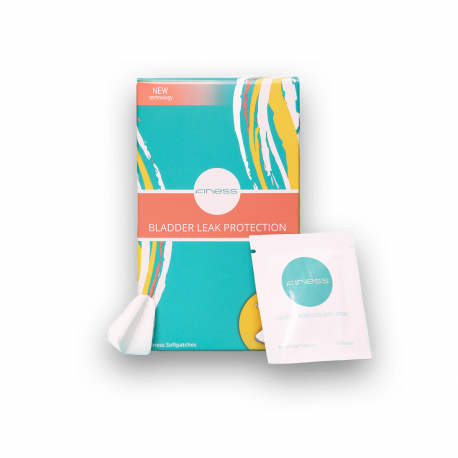 Clinically tested to stop bladder leaks before they happen, the Finess Softpatch is super lightweight, discreet, and comfortable. Finess allows you to enjoy all of your favorite activities without fear of an ‘oops moment’. No need for pads. No need to absorb leaks. No need to worry. Finess inserts are easily placed over the urethra opening, feeling cool to the skin, soft to the surrounding area, virtually not felt when moving about and it does not show. There’s no fuss with Finess inserts. They are easily removed and disposed of each time there’s a call to nature and protect me during the interim when there’s a tiny unexpected dribble. I am confident my hygiene stays fresh all day. I WAS WANTING A PRODUCT LIKE THIS. THANK YOU FOR COMING OUT WITH A DISCREET PRODUCT. ITS SMALL ENOUGH TO PUT IN THE PALM OF YOUR HAND. THE COST IS NOT BAD AT ALL. YES, I WOULD RECOMMEND THIS PRODUCT TO ALL THE LADIES OUT HERE. Only used a few times but so far am very impressed. I teach fitness classes and once you start exercising you don’t even notice they’re there. I usually forget about it till the next time I use the restroom. I would highly recommend this for women who struggle with leaking while exercising. These are amazing! I have bladder issues from 2 back to back pregnancies and these make it so i can work out with out peeing myself. I need like 1000 of them! I use these when I am going out for a few hours. Great to use when going to movie, church and work. I love them! These are a great solution for life’s little inconsistencies. Very comfortable and discreet. I would recommend this product. I take it off and put it right back on after I use the bathroom. I couldn’t afford it otherwise. It continues to stick with no problems. It works good for me. I am going to use them at night. Because that’s when I have the most problems. Great product. Finally a product that isnt big & bulky and can not be seen through my pants! It worked beautifully for me, and I could barely tell it was there. Iam pleasantly surprised!!! So I was very skeptical about this product. However it is amazing! It is easy to use,you cannot feel it at all and it really works. I only use it for my high intensity interval Bootcamp that I attend three times a week or for running. I was really having a problem until I found Finesse. No more problem!! Wow. Makes such a difference in my life thank u. finally!! something very small and simple! Love it!!! These are a great invention and they work so well. Makes me feel so secure when out in public, I can laugh or sneeze without concerns. It worked. Shockingly! Bronchitis and stress incontinence is a horrible combination. These little things actually stopped any links when I cough! Even with a full bladder. Wow! I am sold! …in their pants. Incontinence is like chicken-egg for menopausal women. You need to stay active, but being active may result in embarrassing accidents. Finally a non-invasive, easy-to-use product that is discreet and effective. Highly recommend for women who don’t want to wear pads, but want the protection against unwanted urine leaks.